This color was a happy accident, one of those fun "chocolate in the peanut butter" kind of colours we brought to the 2013 DFO in Eugene. And folks loved it so much they begged us for more! The rods look a lot like the popular Blue Stardust -- UNTIL YOU MELT IT! Then the amber/purple really comes out! Flame strikes, but the strike deepens in the kiln at regular annealing temperatures. 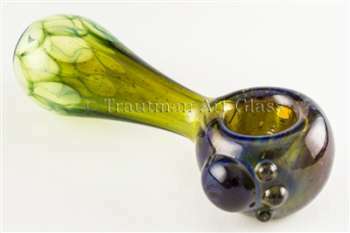 The overall effect is a blue-green amber/purple with the stable sparkles of a Blue Stardust. Shooting Star layers beautifully and retains a lot of transparency, especially when blown thin. Safe to implode.